We had another cold blast of wind and ice this past weekend. It wasn’t polar vortex bad but it was pull out as many hand knits as I could find bad. 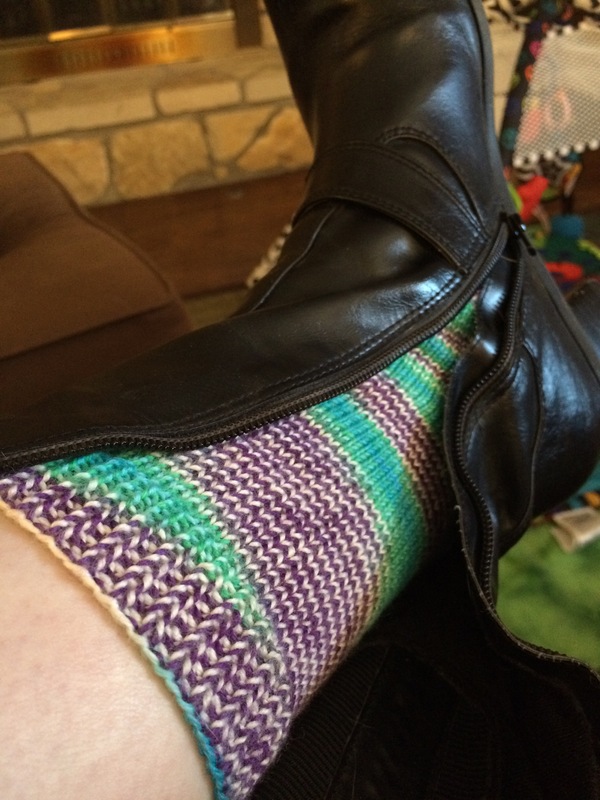 This particular day I had my Rosewood Sockhead Slouch, Present Cowl, fingerless mitts and vanilla socks. I did run out at lunch to make a bank deposit and forgot my hat. I improvised! And received a fair bit of strange looks. But my ears were warm!! 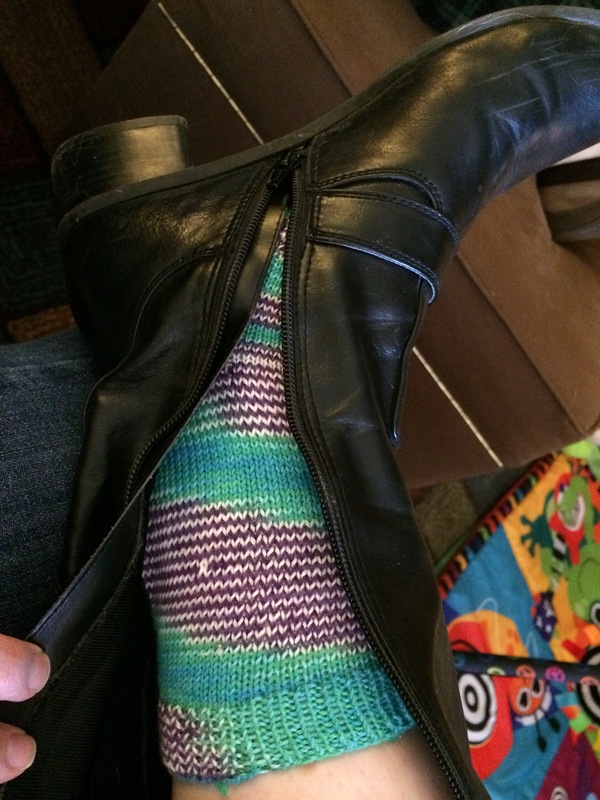 Today I’m wrapping my feet in hand knits. It properly cold outside so out came the boots. Pretty jazzed they still fit after all my pregnancy swelling and shifting! My project is raveled here and blogged here. I’m off to work so happy Wednesday to all! Last week one of my favorite coworkers came to me and asked if I could make a balaclava like hat/mask. He is our maintenance guy and spends a LOT of time outside. He has one that has seen better days and cant find what he wants in stores. So I said sure! He truly appreciates the amount of time and effort that god into a hand knit item. And who doesn’t like knitting for those kind of people!?! So I did some pattern research on Ravelry. His current hat has seen better days but is a pretty basic tube neck with stocking style hat with a ribbed brim and small visor above the eye opening. 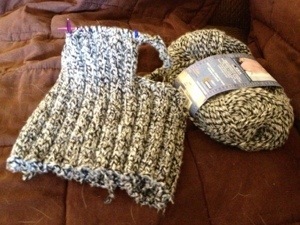 I finally settled on Trav’s Balaclava by Jackie Kelley. This had the basic building blocks that I needed. I figure I can alter the pattern to what I need. I had one skein of Bernat Denimstyle in my stash that had no particular project in mind. It’s the right weight but not enough yardage. So I just chose to not knit the neck section as long as called for to make sure I didn’t run out of yarn before the end. I really just wanted to test knit this project and have a working prototype to show my coworker. I want his input before I knit the final product. So far so good! I’ve completed the (shortened) neck, face hole, and started on the hat section. I need to find a good piece of stiff plastic to use to fill/shape the brim I have in mind. I hope to complete this week and report back to you with his input! My Rav page/link is here. 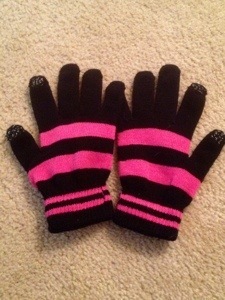 I had a coworker ask me for some gloves she could use with her phone. She spends a great deal of time outside and is addicted to Words With Friends. I had been wanting to try the conductive thread I saw featured in Knit Picks a few issues ago, so in my last yarn order from Knit Picks I added 10 yards of conductive thread. 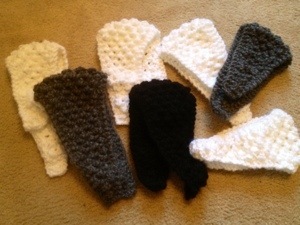 I also picked up some knit gloves from Joann’s dollar bins. After some trial and error I managed to find a way to sew/weave in the conductive thread in between the ribbed stitch texture of the glove fingers. 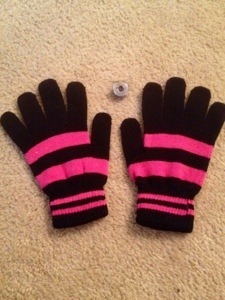 I was easy to sew the left hand but as I’m right handed the right glove was tricky. I only did the forefinger and the thumb. My thoughts on the finished project….very mixed. The thread worked great. The problem lies in getting enough yarn sewn in and on the surface where it can come into contact with the screen. This may be more of a statement on my sewing ability than feasibility of the project. Technically the gloves worked, you just had to press fairly had and get a lot of the conductive thread in contact with the screen. I think this thread would be better served to actually knit into a pair of gloves rather than sewn. Next time I think I will try the pre-made conductive disks….maybe. My coworker was happy enough to test them out for me. But she found the same concerns as I did. Not a project win, but a fairly good attempt/start! Has anyone had any experiments with this thread? I love portable small projects! The cold weather has put my knitting into overdrive. I have a lot of Loops and Threads Charisma and Premier Yarn Serenity Chunky Weight in my stash and I’m chewing through it! 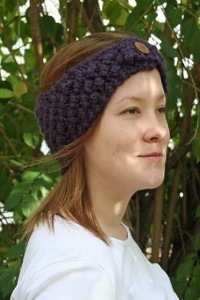 I have blogged about this before, but I purchased a fun pattern Trinity Stitch Headband from Angela Juergens. About half a skein of either of the above yarns makes one headband. 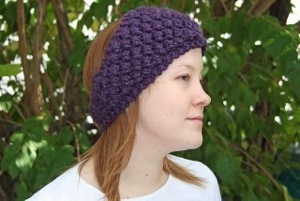 (I alter and take out a few pattern repeats in the pattern for a shorter headband.) I have been packing one of these in my purse every where I go and I’m knocking out some bulky FOs at a pretty good clip. Still need to select and sew on buttons but I’m delighted to see my pile growing. So far my destashing is going full steam ahead….fingers crossed that it continues! 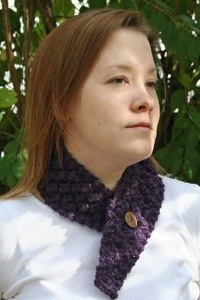 One of my favorite projects for winter is the Trinity Stitch Headband/Neckwarmer by Anglea Juergens. It’s so beautiful, yet a simple knit! I made like 10 of these things while watching the Olympics this summer. I had to even laminate the pattern page because it was getting so much use! I knit all mine using Serenity Chunky Weight by Premier Yarns. Yes yes….it’s acrylic. But it washes well (important when you sweat like I do scooping snow) and its oh so soft and squishy. Plus with my great coupons from Joanns it can be affordable. I can whip several if these out on a lazy Sunday for my “gift” stash. 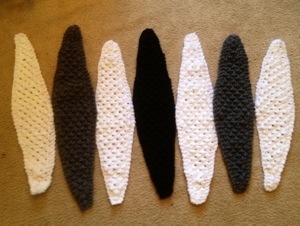 All though truth be told I have several in my own hand knit pile so I can where whatever color suits my fancy that day! The author is a super duper knitter and was so lovely to deal with on the purchase. I highly recommend this pattern! Despite the lack of snow, I got to put on some of my warm (and stylish) hand knits. 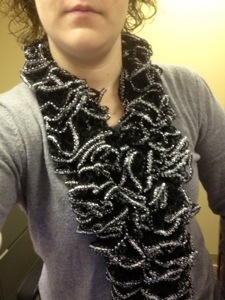 It’s a ruffle scarf knit from Starbella Flash yarn, Rav link here. 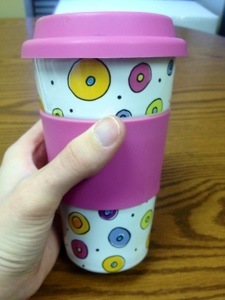 I found this ceramic mug with rubber lid at a clearance Easter sale at Hobby Lobby. It’s easy to clean and keeps my coffee hot hot! Couldn’t live without it. T-minus 14 days to Christmas and I can’t wait! Hand knits always put me in the holiday spirit! !